Taking it back to 2013, Glycolic Acid was the new buzzword in skincare and guess what, I didn't try it out! I kept with my trusty Liz Earle Cleanse & Polish that was serving me just fine at the time. But fast forward 2 years and my skin even though only suffers from minor breakouts, was looking lack lustre with age (boo hoo!) and I now juggle a strange oily/dry skin combination skin type. So a few months ago I decided to try out the much praised B. Revealed Glycolic Cleansing Peel that can be found exclusively in Superdrug and on their website where it's currently half price at £3.95 (normally £7.99)! This has done only wonders for my skin and it's totally a skin care product I would recommend, so I thought I'd finally rave about it! So firstly what exactly is a Glycolic Acid? And what skin types does it benefit? Glycolic Acid is a fruit acid derived from sugar cane and part of the AHA family (Alpha Hydroxy Acids) along with other fruit/food acids such as lactic acid (milk) and malic acid (from apples) and so forth. These natural occurring acids have been used as skincare for the longest time due to there exfoliating yet moisturising properties; in fact the use of AHA's dates back to ancient Egyptian times with Cleopatra bathing in milk to soften her skin! Fast forward 5000 years and of course most of the major (and generally high end) skin care brands now use AHA's, in particular Glycolic Acid, in their skincare. As for what skin types the natural acid can benefit it really does cater for most - whether you are oily (acne), combination, dry or after an anti-ageing product to renew and brighten the skin. So in less boring terms Glycolic Acid works by dissolving the bond that holds dead skin cells together on the very top layer of the skin to reveal a much smoother, brighter complexion that really will take years off you! On to the good stuff now and why this specific cleanser/peel/face mask is currently my jam! 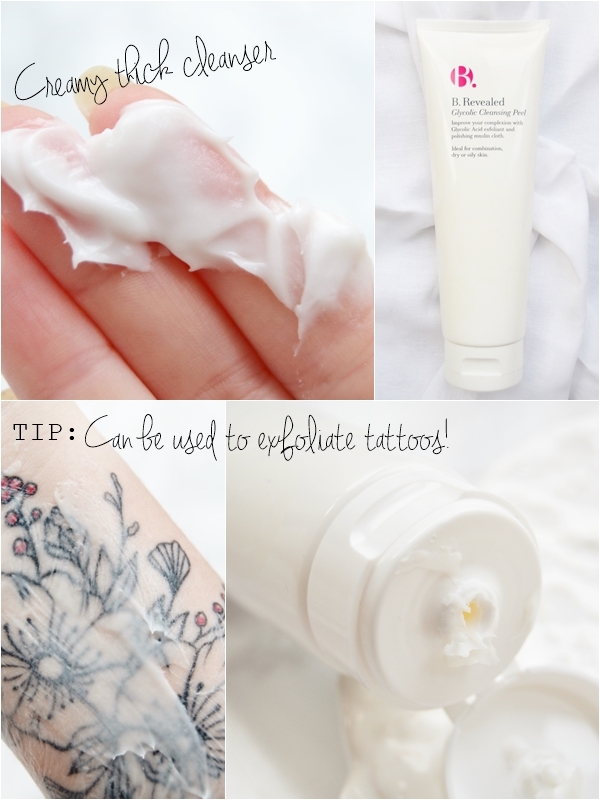 The cleanser is a thick white cream that can either be used much like a face mask for up to 3 minutes or as a regular daily cleanser, and includes a muslin cloth (I use a nice thick flannel - much more effective and comforting). I personally prefer to use this as a skin treatment twice a week before I get in the shower as I've noticed the best result with this but as a daily cleanser is does also work. Once the cleanser is fully removed instantly the face feels so much softer with all dry patches removed and almost renewed feeling skin. I've also noticed as I've kept up using the peel that dull pigmentation to my skin where I've previously had re-occurring blemishes has vastly improved to the point that it's virtually unnoticeable. I also feel like my skin was looking a little blah or should I say lack lustre which I put down to nearing 28 and having an awful sleeping pattern, but again the cleansing peel has worked it's magic and my skin really is looking younger and much brighter all round. My only criticism would be that the cleanser is scented and though it is a pleasant enough scent that doesn't linger I can't help but think it just isn't needed and almost doesn't suit the type of product it is. Overall B. really have come up with an amazing AHA product for those on a budget and I know I would be straying from this as long as B./Superdrug keep on selling it! As you may have noticed I don't often write single product reviews, but really this product is so so good I had to make an exception for it! 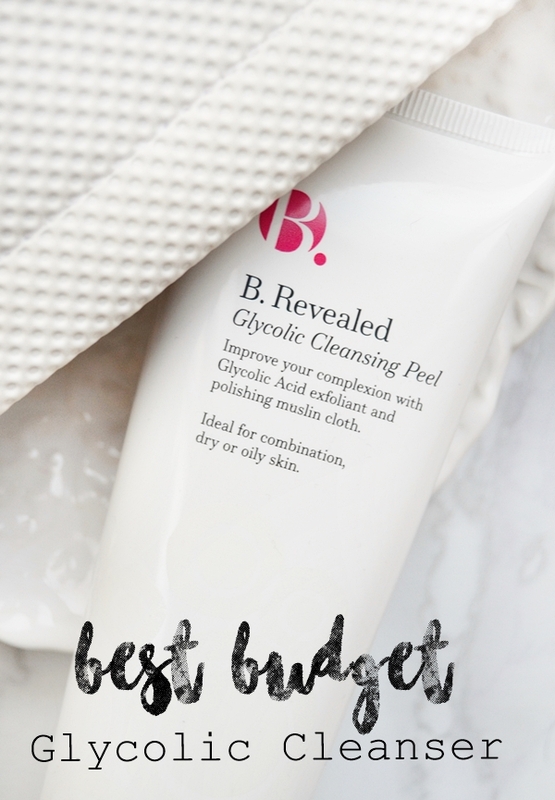 Have you tried of this Glycolic Cleansing Peel or any other similar budget/high street versions?